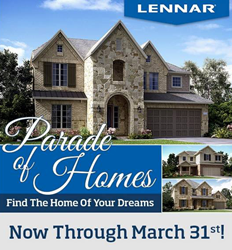 Lennar Houston announces their Parade of Homes Event that will continue until March 31st, inviting guests to tour their quality selection of immediate move-in homes. Please see a New Home Consultant for details. Lennar builds affordable, move-up, and luxury homes in communities that cater to almost any lifestyle in some of Houston’s most desired real estate locations. Lennar’s Everything’s Included homes feature spacious designs, beautiful exteriors, and numerous desirable included features. Lennar’s price ranges from the mid 100s to the $400s. Lennar’s current selection of homes includes single story, two story, and one and a half story homes with upstairs game and media rooms with square footage ranging from 1,200 to 3,800 sq. ft.
Lennar has a longstanding history of building homes of enduring quality with an array of included features in Katy, Richmond, Conroe, Spring, Pearland, Humble, Cypress, Tomball, Kingwood, Rosenberg, Rosharon, Baytown, Fresno, Fulshear, La Marque, Crosby, Willis, and Friendswood. Lennar Houston also offers their innovative line of NextGen® homes designed for multigenerational living, under one roof. The Next Gen® suite provides both privacy and togetherness for today’s modern family—featuring a separate private entrance, bedroom, bathroom, laundry area, eat-in kitchenette, and living room. Welcome Home Centers are open daily in every community from 12:00PM – 6:00PM Sunday- Monday and from 10:00AM – 6:00PM Tuesday- Saturday.